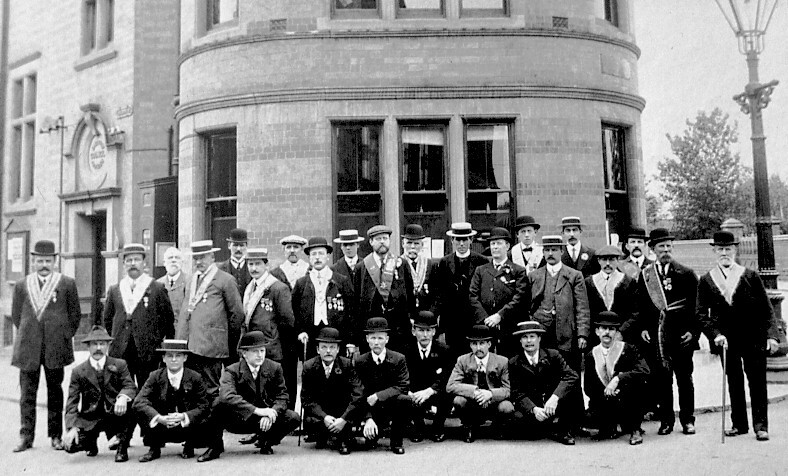 This group, from about June 1912, is standing in front of the Council Offices building, then in The Square, Beeston. The Independent Order of Oddfellows Society (Manchester Unity) was one of several friendly and fraternal organisations which were particularly popular before the establishment of the Welfare State in the United Kingdom, including universal unemployment and sickness benefits and the National Health Service. As a non-profit, mutual organisation, it supported its members in time of need by the redistribution of its income. The local Loyal Nelson Lodge was founded in 1833 and was supported strongly by local tradesmen and working men in particular. In the early days it met at the Cadland Inn in Chilwell but was eventually able to open its own meeting place on Middle Street - popularly known as the 'Manchester Unity' in the house previously built and occupied, as Vicar and in retirement, by Rev John Woolley. The building later became the Beech Tree pub, then the 'Cow at Beeston' and in recent years was demolished to become the site for the Tesco Petrol Station. The above photograph, complete with names, allows us an insight into the membership of the local Lodge. Accordingly, the following table is an attempt to identify individual, based largely on his 1911 census entry and birth and death registrations.While every care has been taken to match these entries with the person shown on the photograph, this cannot be guaranteed. James Monk 1844 Market Harborough, Leics Post Office Square Confectioner , . Thornton Shipham Clarke 1876 Nottingham, Notts Linden Grove Designer & Draughtsman 1951 . John Henry Cross 1873 Hucknall, Notts Gladstone Street Labourer . .
Charlie Whadcote 1891 Beeston, Notts Commercial Ave Cycle Hand . .
John Scothern c1856 Sutton-in-Ashfield, Notts Chilwell Road Framework Knitter . .
Harry Ford 1866 Wymeswold, Notts Imperial Ave Insurance Agent 1928 . William Schofield 1865 Ragnall, Notts Humber Road Railway Platelayer 1939 . Henry Charlton 1851 Chilwell, Notts Chilwell Rate Collector & Grocer 1933 . Fred Stansfield 1881 Rotherham, Yorks Gladstone Street Plumber 1942 . Robert Drinkwater 1859 Chilwell, Notts Chilwell Lace Maker 1912 . George Taylor 1874 Wollaton, Notts Wollaton Road Beer-off keeper 1932 . W Simmons ?? , . . . .
Edward Price c1843 Hampton, Warwicks Middleton Street Retired Signalman 1927 . Walter Gilder 1865 Thaxted, Essex Denison Street Iron Foundry Labourer 1926 . Samuel Johnson Martin 1882 Beeston, Notts Chapel Street Boiler Fitter 1938 . Joseph Hart c1866 Hathern, Leics Mona Street Foundry Labourer 1938 . William Harvey Walsh 1864 Southwell, Notts City Road Foundry Labourer 1935 . C Attlee ?? . . . . .
Richard Cropper 1885 Fiskerton, Notts Humber Road Tester in Foundry 1961 . Henry Fox c1869 Sheffield, Yorks Windsor Street Grinder . .
Fletcher Warrington 1877 Heckington, Lincs Clifton Street Baker's Vanman 1959 . 1. In 1901, Arthur Price was the Master of Carmathen Workhouse. 2. Arthur Nicholls served with the 11th Btn Sherwood Foresters (Notts & Derby Regiment) during the Great War. He was killed on 1st July 1916 and is remembered on the Thiepval Memorial and on his parents' memorial in Beeston Cemetery. 3. Named as 'H Cropper' in the newspaper but probably Arthur Cropper, as detailed here. 4. Became a Registrar of Births & Deaths and was the father of Harry Pegg, the Pork Butcher. 5. Harry Pegg, Secretary of the Manchester Unity, was granted probate of his estate.